MLK Day of Service - BUILD, Inc. It was a bitter cold day in Chicago on January 21, and though many had the day off of work and school, over 100 youth and community members chose to make it a day on at Christ the King College Prep in memory of Dr. Martin Luther King, Jr.
BUILD’s MLK Day of Service kicked off by welcoming participants in from the cold with pastries, hot chocolate, coffee and sandwiches. 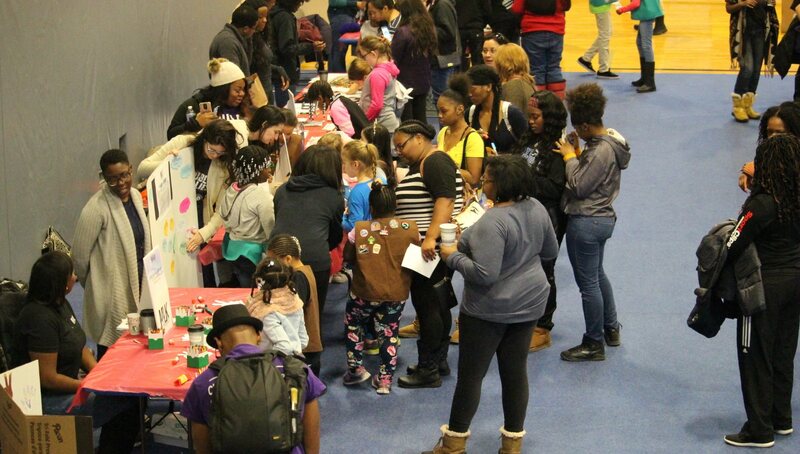 Throughout the morning, the gymnasium was packed with a variety of activities to engage youth in service projects, discussions and the creation of uplifting messages. At one station, youth helped assemble packages of winter essentials like hats, gloves and hand warmers to distribute to those in need. 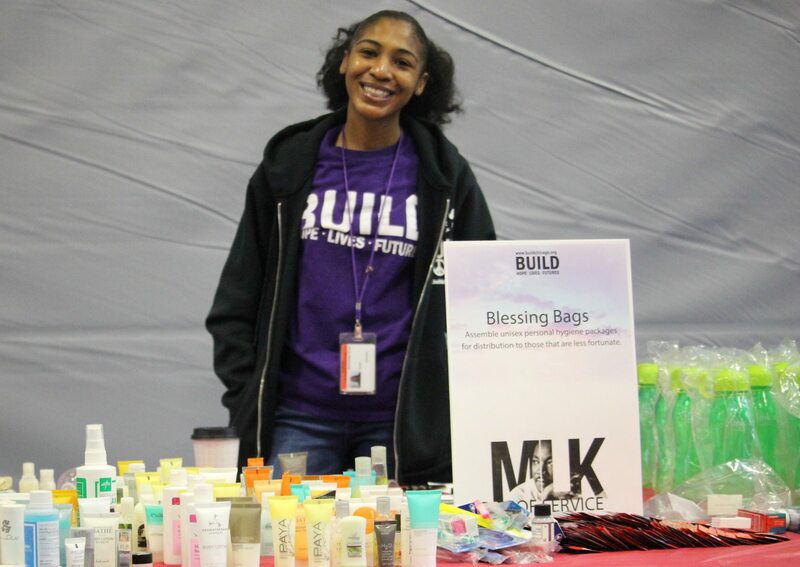 At another station, they helped create “Blessing Bags”, containing items such as insulated lunch bags, soap, toothpaste, toothbrushes and water bottles. Personal hygiene packages were also created specifically for women in need. Some of the inspirational activities included creating “Messages of Hope” in which youth wrote down words of encouragement to those who are less fortunate. On the “Wall of Dreams”, youth shared their thoughts and ideas about how to heal and rebuild communities. And at the “My Two Hands” station, youth colored in hands and pasted them to a collage board as a pledge to their commitment towards change. In addition to community service and inspirational messages, tribute to Dr. King played a large role in the festivities of the day. 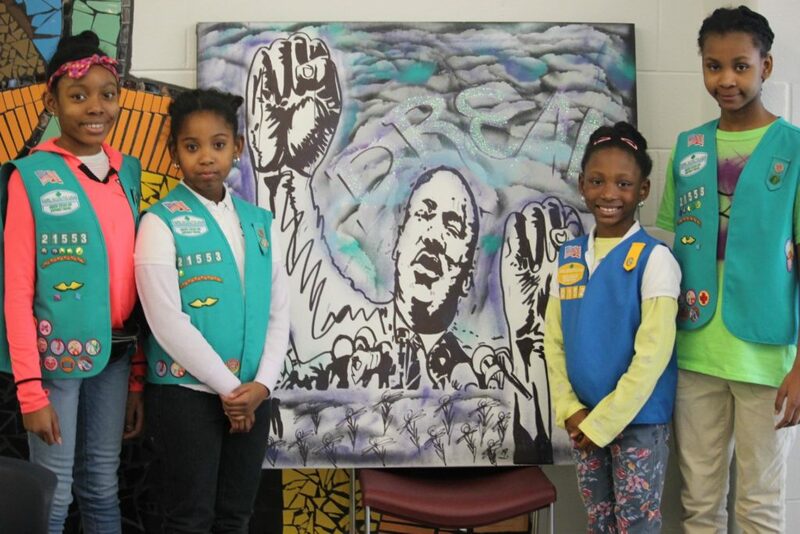 At one point, several youth took center stage, and one by one, as all the eyes in the room focused on them, they shared some of Dr. King’s most famous words. Games like “MLK Bingo” and “MLK Jeopardy” provided interactive ways for youth to learn about and remember the life of Dr. King as well. The event at Christ the King concluded with a raffle, in which 5 kids rolled out on brand new bicycles, and a lunch of pizza, sandwiches and cookies. But the day of service was not over. With the “Blessing Bags” in hand, BUILD staff and several youth headed out to the streets to distribute them to those in need. The first stop took place at a “tent city” just off the highway near downtown, where people experiencing homelessness set up their own community and sleep in tents. In addition to the “Blessings Bags”, BUILD also arranged for Phlavz Caribbean Jerk food truck to stop by and offer a hot meal on an absolutely frigid day. As BUILD staff delivered the gift bags to each tent, they also offered amazing tacos with a Caribbean flair to all those who wanted them. The next stop for BUILD and the Phlavs food truck was the Franciscan House, a shelter for men and women on Chicago’s West Side. 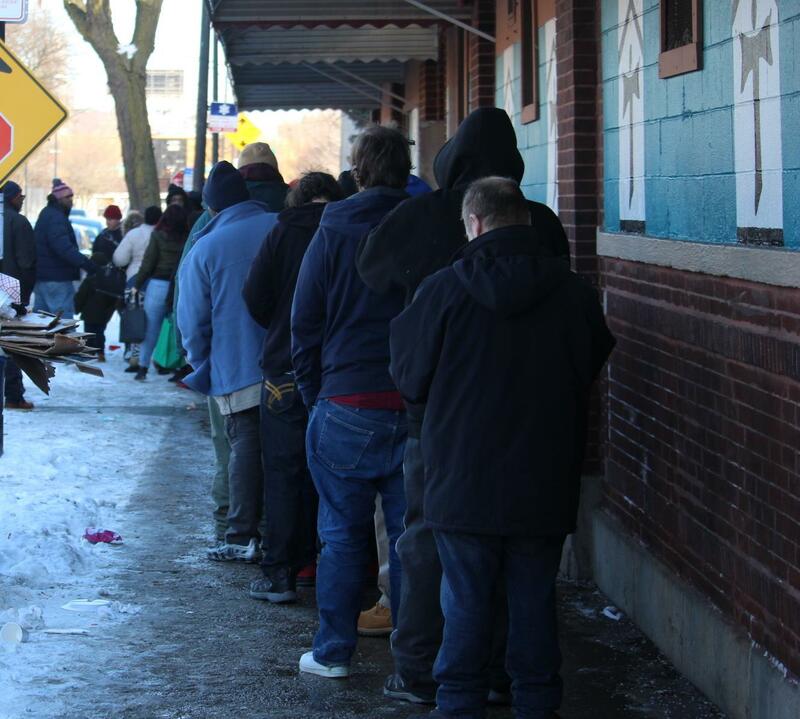 Once there, those in the shelter formed a line that stretched nearly the entire block as they waited for some amazing Caribbean tacos. It was truly an inspiring day filled with selflessness, kindness, sharing and celebration. We are so grateful for the life that Dr. King lived and the opportunities he created for us today. We also want to say a special thank you to all those who gave of their time and resources to help make our MLK Day of Service so special: Christ the King Jesuit College Preparatory School, Oak Street Health, Rush University Medical Center, Public Allies, buildOn, Girl Scouts Chicago, Federal Reserve Bank of Chicago, Phlavz and singer, songwriter, rapper, and record producer, Jeremih and all of our volunteers.